We received the 5-Star Supplier Excellence Award from Raytheon Integrated Defense Systems (IDS), one of the divisions of the US giant which has been supplied with electronic systems manufactured at the Malaga plant for several years. 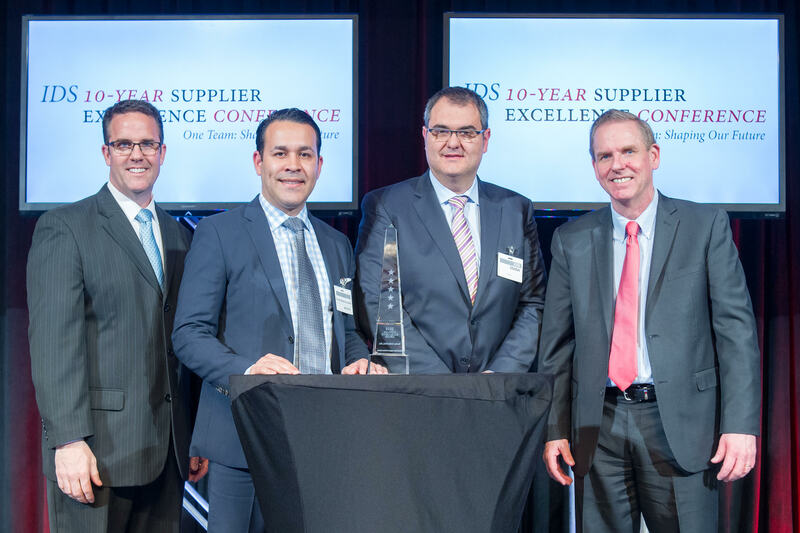 This recognition was awarded at the tenth edition of the Supplier Excellence Conference held in Boston, Massachusetts, on 2 May 2017. The award acknowledges MADES’S excellent performance as a member of Raytheon IDS’s supply chain. Its supplier database has over 3,500 active companies, from which only 350 delegations were invited to the gala. During the event, 143 companies were acknowledged with this service level with more or less importance. MADES was one of only twelve companies receiving the 5-Star Award. It is the top-rated recognition granted by Raytheon to its suppliers. MADES should be congratulated thanks to the international repercussion and difficulty implicit in this award. The award acknowledges the partners’ ability to maintain 100 % on-time delivery and 100 % quality assurance in a sustainable way. Technology is basic for attaining such levels of operational excellence but it would be worthless without having a team whose professionalism, efficiency and dedication are the day-to-day cornerstones. Thanks to this talent-technology pairing, MADES is differentiated and continues to reinforce its role as the ambassador for the Spanish electronic industry applied to defence and aerospace. Today, MADES celebrates its success without losing sight of the responsibility of having to ratify its status as a strategic partner in forthcoming editions. The objective is to continue enhancing its integration as an Electronic Manufacturing Service (EMS) supplier to leading European and US aerospace and defence companies. Photo- From left to right: John P. Benergon (Vice President Mission Assurance, IDS); Jean Montalvan (Managing Director, MADES); José Osuna (Manager Engineering and Operational Excellence, MADES); Michael B. Shaughnessy (Vice President Integrated Supply Chain, IDS).